• (U//FOUO) Al-Shabaab employs Improvised Explosive Devices (IEDs) against the Transitional Federal Government (TFG) and African Union (AU) peacekeepers in Mogadishu. • (U//FOUO) Al-Shabaab employed five Suicide Vehicle-borne IEDs (SVBIEDs) and one Person-Borne IED (PBIED) between January and December 2009, primarily targeting TFG leadership and AU peacekeepers. • (U//FOUO) More than 80 percent of all IED-related fatalities were associated with SVBIED and PBIED in 2009. • (U//FOUO) Al-Shabaab will continue to focus its IED efforts against TFG and AU operations as part of a strategy of attrition and exhaustion. (U//FOUO) Shabaab al-Mujahideen (aka al-Shabaab, aka Mujahideen Youth Movement) is the Salafist-Jihadist off-shoot of the Mogadishu-based Islamic Courts Union (ICU). Al-Shabaab’s leaders maintain connections with al-Qaeda, and receives financial, logistical, and rhetorical support. The group is fighting the internationally recognized TFG for control of Somalia’s southern cities, and ultimately seeks to control the entire Horn of Africa. Al-Shabaab employs IEDs in support of its broader strategy of ousting the TFG and the contingent of African Union peacekeepers (mostly from Uganda and Burundi) protecting the TFG, called the African Mission in Somalia (AMISOM). As a result, their IEDs target TFG and AMISOM personnel and operations. Al-Shabaab will continue to focus its IED efforts against TFG and AMISOM operations, primarily in Mogadishu, as part of an al-Qaeda-inspired strategy of attrition and exhaustion. (U//FOUO) Al-Shabaab substantially increased its use of IEDs after the Ethiopian invasion and subsequent occupation of Somalia from late 2006 through 2008, going from a few incidents in 2006 to 74 in 2007. Since the Ethiopian military pullout in late 2008, al-Shabaab now targets TFG leadership and the AMISOM presence in Mogadishu and several other towns, mostly in southern Somalia. For example, in August and October 2009 IEDs targeted AMISOM military vehicles in Beledweyne and Mogadishu, respectively. (U//FOUO) Al-Shabaab leadership takes credit for the Ethiopian pullout, suggesting that their IED, mortar, and small-arms harassment operations forced the regional military power to flee As a result, it now integrates all these tactics into its broader insurgency strategy. IEDs will remain a significant threat to TFG, AMISOM, and foreign organizations operating in the country as long as Al-Shabaab sees value in their use. (U//FOUO) The TFG maintains its own military and police capability and a symbolic presence in Mogadishu around the presidential palace (called the Villa Somalia) and the Mogadishu airport. A contingency of African Union troops protects TFG assets and trains its military under a mandated mission. Al-Shabaab regularly emplaces IEDs along roads that connect AMISOM and TFG bases of operations within Mogadishu. These include ongoing attacks around the K4 intersection and the airport. For example, of the 19 IED attacks in Mogadishu between January and the end of June 2009, at least 6 were identified at the K4 intersection. The pattern continued for the rest of 2009, including at least four more IED incidents targeting AMISOM vehicles in Mogadishu. The Maka al-Mukarama road that crosses the K4 intersection and connects the AMISOM base (at the former site of the Somali National University) to TFG’s base at the Villa Somalia is also identified as a location with a high number of IED attacks. (U//FOUO) Al-Shabaab continues to fight AMISOM and TFG security elements throughout Somalia, eschewing intentional targeting of civilian populations and foreign aid workers. 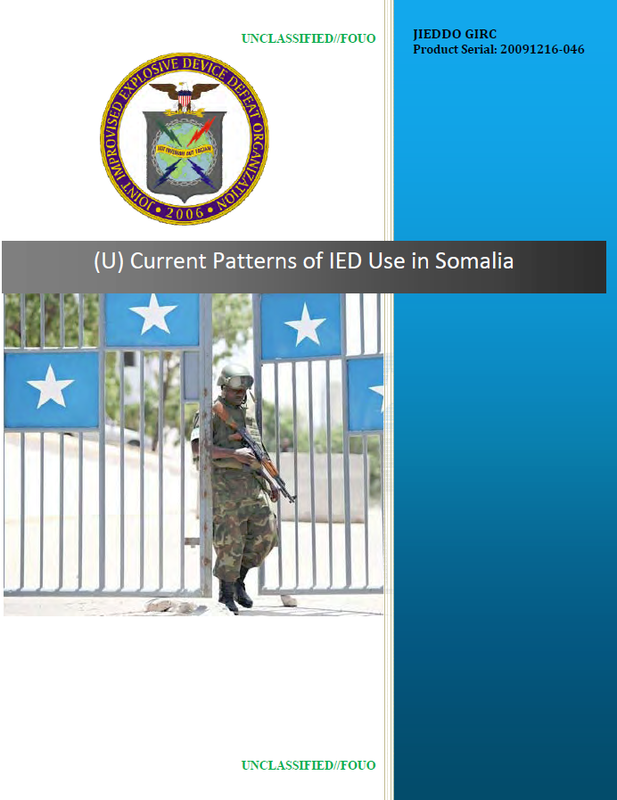 For instance, they employ IEDs in locations known to be bases of AMISOM and TFG operations in Mogadishu, a geographic shift from previous years and a response to the relocation of the TFG from Mogadishu to Baidoa and back to Mogadishu. It suggests a TFG-centered strategy rather than one that intends to coerce popular support.